06-02-2015 : PG TRB Exam 2015 Result and Final Answer Keys published by Tamilnadu Teachers Recruitment Board (TRB) in its official website www.trb.nic.in. 21-12-2014: Teachers Eligibility Tests (TNTET) should be conducted every year. - Honourable Madras High Court to Government of Tamilnadu . Dinamani News,21-12-2014 . Read all latest news about TNTET Exam 2015. 20-10-2014 : Today TRB has published provisional mark list of TRB Assistant Professors Recruitment 2012 and Provisional list of PG Assistants Recruitment 2012-2013 selected candidates for certificate verification. TRB yet to publish the provisionally selected candidates list of TNTET Paper 1 (Secondary Grade Teachers) for the Adi Dravidar Welfare Schools , the list is also expected to be published soon. 19-10-2014: 2010-2011 Appointed Graduate Teachers need not write TNTET Exam. The Tamilnadu Directorate of School Education has clarified that the graduate teachers (BT Assistants) who had certificate verification before 23-08-2010 and received appointment orders in the year 2011 need not qualify in TNTET Exam conducted by TRB. 14-10-2014 : TRB Published Provisional Selection List of TNTET Paper 2 candidates for the Direct Recruitment of BT Assistants for Minority Subjects in the Department of School Education, Elementary Education, BC and Welfare Deptartment, Adi Dravidar Welfare Department, Chennai Corporation Schools and Coimbatore Corparation Schools. Visit TRB Official Website http://www.trb.tn.nic.in/ for more details. 12-10-2014 : Latest news on TNTET 5% Relaxation case from http://www.gurugulam.com . On 25-09-2014, the Madurai Bench of Madras High Court quashed the 5% relaxation order by Tamilnadu Government in the TRB TNTET Exams. A TNTET candidate from Madurai has asked whether the government goes for appeal in the TNTET 5% relaxation through CM Cell. For that query, the government has answered that after receiving the order copy necessary steps on the feasibility of filing an appeal in the above case will be taken. 07-10-2014 : News about TRB TNTET Paper 1 and Paper 2 Second List - in todays The Hindu Tamil (தி இந்து) newspaper. News Summery : Madurai Bench of Madras High Court has quashed the Tamilnadu Government's order to grant 5% marks relaxation in TNTET Exams. Because of this court order, TRB is in a confusion whether to publish the list with 5% relaxation or with out 5% relaxation. If the government goes for appeal in the TNTET 5% relaxation case and gets judgement in favour for 5% relaxation, the list will be published with 5% relaxation. Otherwise the candidates with 90 marks will only be considered. The candidates have to wait till the government's next move in this case. 26-09-2014 : Madurai Bench of Madras High Court Quashed TNTET 5% Marks relaxation. Today's newspaper news. Appointment orders of newly selected teachers through TRB TNTET Exams are issued from today's (25-09-2014) afternoon onwards. Candidates can receive their appointment orders from the respective counselling centres where they have attended counselling. All the best ! 24-09-2014 :Teachers appointment stay order removed in Madurai Bench of Madras High court today. 23-09-2014 : The government to seek Madurai Bench of Madras High Court to remove the stay order in the teachers appointment .| The appointment orders to be issued immediately after getting stay order removed. | Candidates affected by TNTET weightage marks to appeal in Supreme Court . A detailed news report about TNTET cases by Dinamalar newspaper, 23-09-2014. 22-09-2014 :TRB TNTET Weightage related cases dismissed in Madras High Court. website before 25-09-2014 . Only 5 more days for the deadline, if you have not downloaded the certificate, please download it as soon as possible. 15-09-2014 : TNTET Cases taken for hearing today at Madras High Court. Morning 5 % TNTET Marks relaxation case was heared and evening cases related to G.O 71 . Hearings to be continued tomorrow also. 14-09-2014 : Tomorrow ( 15-09-2014 ) TNTET related cases coming for hearing in Madras High Court . Since the Tamilnadu government's appeal in the Madurai Bench did not come for hearing till yesterday, we can expect some important news about in the TNTET weightage case tomorrow. Visit Madras High Court Daily Cause List for TNTET case hearing details. 13-09-2014 : 22000 TNTET Eligible candidates not downloaded the TNTET Certificate from the http://tntet.in/TRB/ website. TRB instructs the candidates to download the certificates before 25-09-2014. ஆசிரியர் தகுதிச் சான்றிதழை 22,000 பேர் பதிவிறக்கம் செய்யவில்லை Read news 12-09-2014 : Committee to be appointed according to the court's guidance to solve the TNTET Weightage Marks Problem. Honourable School Education Minister K.C.Veeramani informed. News Source Malaimalar. 10-09-2014 : Problems in teachers appointment may be solved with in this week - Dinamalar news. 10-09-2014 : Appointment Orders for 12,347 teachers are ready to be issued and waiting for the High Court Order. -தி இந்து newspaper. 03-09-2014 : Download TNTET Paper 1, Paper 2 Certificate from TRB Website. TRB TNTET Paper 1 and Paper 2 Certificates can be downloaded from the following website. Note : You will be allowed to download the TNTET certificate only two times. So before downloading the certificate read the "how to download instruction" provided in the website carefully. 03-09-2014 : Madurai Bench of Madras High Court has stayed Secondary Grade Teachers and Graduate Assistants Appoinment based on TNTET Weightage Marks. Court allowed to conduct the counselling. 31-08-2014 : TRB PGT Counselling for Candidates Own Districts was held on 30-08-2014. According to School Education Director 906 candidates were issued appointment orders. Today (31-08-2014) 1400 candidates (Other than own districts posts) are to be issued appointment orders. 30-08-2014 : PGT Counselling starts today. Best wishes for all selected candidates ! May GOD Bless your Teaching Career ! 28-08-2014 : Counselling Dates for PGT , BT Assistants and Secondary Grade Teachers Announced. Honourable Chief Minister Issued Appointment Orders for 14,700 newly selected PGT, BT Assistants and Secondary Grade Teachers . In a function in Chennai, today, Hon'ble Chief Minister provided appointment orders for 7 candidates from the newly selected PGT, BT Assistants and Secondary Grade Teachers. 27-08-2014 : TNTET Paper 1 Provisional Selection List for Secondary Grade Teachers Recruitment 2012-2013 Published today. 26-08-2014 : TRB Published TNTET Paper 2 - BT Assistant Tamil Additional List of Selected Candidates for the appointment. 25-08-2014 : TNTET Paper 2 Additional Vacancies Published on TRB Website . TRB has published details of additional BT Assistants Posts for the 2012-2013 recruitments. The additional vacancies are from Adi-Dravidar Welfare DepartmentSchool, BC and MBC Welfare Department Schools and Chennai CoimbatoreCorporation Schools. In this Second List Tamil Subject and B.T.Assistant vacancies in minority language medium (Telugu, Malayalam,Kannada and Urdu) for School Education Department also published in the notification. 23-08-2014 : TRB published important instructions for TNTET Paper 2 Selected candidates who are also qualified in Paper 1 . According to the instructions , those who are willing to prefer Paper 1 Post and cancel their selection in Paper 2 Posts can report the TRB Office, Chennai on 25-08-2014. 22-08-2014 : TRB handovers selection list to School Education Department. News Teachers appointments will be soon. 21-08-2014 : Notification for Direct Recruitment of Secondary Grade Teachers (with number of vacancy details for paper 1 candidates) is published in TRB website today. 20-08-2014 : 12588 teachers appointment soon - Ms.D.Sabitha.IAS. In an official meeting at Dindigul District, the Principal Secretary, School Education has informed that this year 12588 teachers including 1267 PGT and 11321 Graduate Teachers will be appointed. 19-08-2014 : 11900 teachers to be appointed soon. School Education Department Principal Secretary Ms. D.Sabitha.I.A.S., informed this in an official meeting at Tanjore on 18-08-2014. Dinamani Newspaper article says the TRB will handover the selection list to the Elimentary Education and School Education Directorates with in this week. Based on the selection list Online counselling will be conducted for appointment of the selected candidates. The appointment orders for the selected candidates will be issued in the function presided by Honourable Chief Minister. The date of the function is to be decided with in one or two days. The Selection List of Paper 1 Candidates and remaining PGTs will be published before the function date. Thanks and Courtesy தினமணி, 18-08-2014. 17-08-2014 : According to today's Dinamalar Newspaper, TRB is to give the selection list of selected PGT and BT Candidates to School Education Department . After receiving proper communifiation from the TRB, the School Education Department will proceed the appointment process. 14-08-2014 : In a official meeting at Thiruvallur on 13-08-2014, Honourable School Education Minister Veeramani has informed that 12600 teachers will be appointed soon. The posts includes 1367 PG Teachers and 11321 GT's. 11-08-2014 : Expected salary of newly selected Post Graduate Teachers (PGT) , BT and Secondary Grade Teachers. 10-08-2014 : TRB TNTET Paper 2 Final Selection List Published Today. 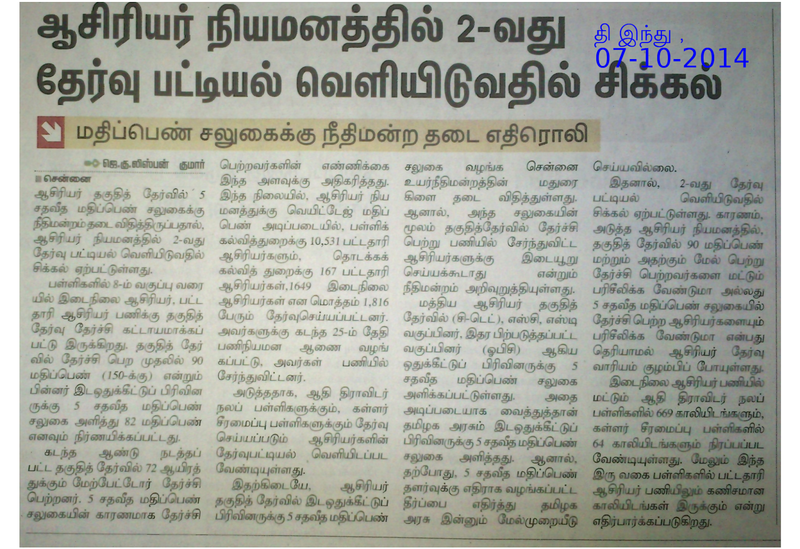 08-08-2014 : According to Dinamani Newspaper dated 08-08-2014, senior Officer from TRB has informed that the teachers recruitments including PGT, BT Assistants, Secondary Grade teachers will be completed with in one month. He also assured that BT Assistant Final Selection List and PGT Final Lists will be published with in 7 - 10 days. After that, Secondary Grade Teachers selection list will be published. 06.08.2014 : TNTET Paper 1 Provisional Mark List and Notification for Secondary Grade Teachers Recruitment 2012-2013 Published. 04.08.2014 : TRB Published Paper 2 Additional Vacancies in the Department of School Education and Department of Elementary Education. According to Dinamani Newspaper, (Click to read the news) the TNTET Paper 2 Final Selection List is expected to be published on today ( 04-08-2014 ). The list may be out any time . But please note that, there is no official announcement from the TRB regarding this. If there any news from TRB, soon we will update here. You may visit the TRB's Official Website frequently. 30-07-2014 :TNTET Paper 2 - BT Assistants Selection List to be published with in one or two days- According to today's (30-07-2014) The Hindu Tamil Newspaper, one of the official from TRB has assured that the TNTET Paper 2 Selection List for the appointment of BT Assistants Recruitment is ready and may be published with in one or two days. 24-07-2014 : Appointment Orders for 15,000 Teachers with in 3 Weeks - Honourable School Education Minister. Yesterday (23-07-2014) answering to a question by a communist MLA, the Minister replied the appointment orders for about 15,000 teachers will be issued with in 3 weeks based on the TNTET Rank List. So the TNTET Paper 1 Provisional Mark List and Final Selection list may be expected with in this month end. 17-07-2014 : Some newspaper articles says that the cut off for history and english might be slightly lower this time because of increase in vacancies for those subjects . 15-07-2014 : A higher Official from TRB has informed that the Final Selection List of ( TNTET Paper 2 ) BT Assistant 2012 - 2013 Recruitment will be published on 30-07-2014 . Source : Today's Thinathanthi News Paper. 2. Just for visualization of total number of vacancies only. For original data and clear information you should rely on TRB's official website trb.tn.nic.in only. 13-07-2014 : Teachers Appointed after 23-08-2014 Should Complete TNTET Exam before August 2015. The teachers who have been appointed after 23-08-2010 should pass TNTET exam with in 5 years. It is applicable to Private School Teachers also. So, if such candidates want to continue as teachers , they should complete TNTET exam before August 2015. 12-07-2014 : Honourable Minister's Speech about Teachers Appointment : Today there is a hot news and discussions in all Education and Teachers related websites about the Honourable School Education Minister's speech about Teachers Appointment 2014 . According to the news, the Minister has informed, 18000 teachers posts will be filled with in 15 days. So we can expect the TNTET final rank list and Final Selection list to be published soon. All the best ! A new case was filed against new TNTET weightage mark system in Madurai High Court Branch . The case was filed by Prabhakar , a M.Sc., M.Ed., and TNTET qualified candidate from Puthukkottai. The main arguement was made on the Plus Two and Degree Weightage Marks calculation. He argued that the current weightage calculation method will affect the candidates who studied plus two and degree 10 years ago. 21.06.2014 : Recently TRB has published Paper 2 Results of TRB Special TET candidates on 13-06-2014 . So it is expected TRB will soon publish the final Rank List and Selection List for the TNTET 2013 candidates. This time the appointment process will also be in speed mode, as all schools are already opened in Tamilnadu. TRB announced TNTET Paper 1, Paper 2 New Weightage Marks - Government Order - How to calculate - full information. 22.04.2014 : TRB Announced TNTET Paper 2 Call Letter for Certificate Verification of 5% Relaxation Candidates - The CV for 25333 candidates of TRB TNTET Paper 2 is scheduled to be conducted from 06-05-2014 to 12-05-2014. So we can expect the appointments of the successful candidates before June 2014. 02.04.2014 : TRB has already finished the Certificate Verification process of TNTET 2013 Paper 1 Candidates who come under 5% marks relaxation. Now all the Paper 2 candidates (nearly 27,000) are awaiting for their term for certificate verification. Since, the election code won't affect TRB Certificate verification process, Paper 2 Certificate Verification is expected to be started with in one or two weeks. The Call Letter, Bio date form and Identification Certificates may be issued through online with in a week. Keep in touch for latest updations. 25.03.2014 : The announcement for this year TNTET 2014 Exam notification may come after the Parliamentary Elections 2014. Any how, till today, there is no proper notification from the TRB about the TNTET exam 2014. 28.02.2014 : TRB has announced the rank wise mark list of the successful candidates, who have benefited from the 5% relaxation of marks. Click the following link to check your name on the District wise list. 29.01.2014 : Tamilnadu Government may consider the reservation system in TRB TNTET (Tamilnadu Teachers Eligibility Test Exams). The news on dinamalar website dated 29.01.2014 says the government is on serious discussion about this issue. If the government decides about implementing Community Reservation in TET Exam, the Honourable Chief Minister may announce the good news to all TNET aspirant of Tamilnadu. TRB has published the results of TNTET 2013 Paper 1 and Paper 2 Exams held on 17.8.2013 & 18.08.2013. Check soon in the TRB Website.TRB has informed that about 4.80% of the candidates have successfully cleared (qualified) the exam. This shows there is about 5/20 candidates have successfully got qualified in the TRB TN TET 2013 Exam. Thus the marks scored in the exam may play vital role in deciding the candidates' fate. How many total vacancies in TNTET 2013 Exam ? TNTET 2013 Cutoff Marks for Paper 1 and Paper 2 will be Published Later. "TNTET Results 2013 Publication can not be stopped - Madras High Court Judgement"
The Madras High Court has informed that the publication of TNTET 2013 results can not be banned. But, the results will be bound by the High Court Judgement dated 18.11.2013. So we can expect the results in one or two days. This year about 13,000 posts to be filled through TNTET Exam 2013. Among them about 10,000 posts are Graduate Teachers and about 3000 posts are Secondary School Teachers. According to Hindu Tamil Newspaper, almost all the results publication works are over and the TNTET Exam 2013 Results to be published with in a week. The Thina Thanthi News Paper news informed that the Answer Sheet Evaluation Works Over and now the verification process is going on. About 90 % of the works are over and the TNTET 2013 Results to be published with in 10 days. The most waited results of Tamilnadu Teachers Eligibility Test 2013 are expected to be published this week. Most probably the TNTET 2013 Results may be published tomorrow. Because, trb has recently published PGT exam results other than tamil subjects, so it is strongly expected that the TNTET Exam 2013 Results also may be published immediately, with in this week. The reason for this delay may be the major cases in the High Court and the recent judgement regarding the PG TRB Tamil Subject Re-Exam. The TRB TNTET 2013 Results are expected to be published in this week(First week of October). But there is no authorised news from TRB yet. Because, 20.09.2013 Dinamalar Newspaper news informed that the Results of TRB TNTET Exam 2013 will be published in the Last week of September 2013 or in the first week of October 2013.Note, this year around 50,000 candidates are expected to clear the TNTET 2013 Exam successfully. So the real competition is with the higher marks you score in the result. All the best ! In order to prepare the Teachers Training Students for TNTET Paper 1 Exam, the government has decided to introduce, TET Syllabus Oriented papers in their studies. The new changes are expected to be implemented in the year 2014. TRB has published the Hall Tickets for the TRB Tamilnadu Teachers Eligibility Test ( TN TET) 2013 Exam to be conducted on 17.08.2013 ( Paper 1) , 18-05-2013 ( Paper 2) . Previously there were some news saying the Hall Ticket Publishing Date as yesterday 05-08-2013 , but it was published on 06.08.2013 (After 3.00 pm) only. Since about 7 lacks candidates download tntet hall tickets, you may find difficulty in opening the exact links as the server busy some times, so use these direct links to download TNTET Exam 2013 Hall Ticket. Dear TNTET 2013 Aspirants, don't confuse about the rumours about the TNTET 2013 Postings. Be concentrated on your preparations. TRB has again announced there will be very straight selection process, no place for malpractices. Study hard. All the best ! TRB . Since tomorrow 01.07.2013 is the last date to submit TRB TNTET exam, it is expected atleast 6.5 lakhs applications this year. TNTET 2013 Exam Hall ticket issue date will be announced soon by the TRB. TRB has not published the TNTET Exam 2013 syllabus. It is expected the TRB will update the latest syllabus for the TNTET 2013 Exam in the first week of June 2013. TNPSC Portal will update the latest syllabus immediately when TRB publishes a new syllabus in their website www.trb.tn.nic.in. Visit www.trb.tn.nic.in for the advertisement about TNTET 2013. TNTET 2013 Exam has been announced by TRB on 22.05.2013 , See Advertisements in Dinathanthi Newspaper. Tamilnadu Teachers Recruitment Board, TRB has announced Tamilnadu Teachers Eligibility Test 2013, Application Issue Date, Last Date of Application and TNTET 2013 Paper 1 and Paper 2 Examinations Dates. Tamilnadu Teachers Recruitment Board is going to conduct the Teachers Eligibility Test 2013 or TNTET 2013 in the December month of 2013. The government has already set a policy that there should be atleast 2 1/2 months gap between the TNTET Exam announcement and the TNTET Exam date. So the announcement may come in the month of June, July or August. One more Information Dinamani newspaper Dated 16.05.2013, in a article has mentioned that TRB TNTET 2013 announcement will come in two or three weeks. Update on 10.11.2013 No Changes in TNTET 2013 Cut off Marks or no reduction in the Minimum eligibility marks. from 60 % . .Announced by the Government. Updated News on 09.05.2013 - As you all know that TRB has released the advertisement of PG Assistant Teachers and Special Teachers on 9/5/13 and 8/5/13, Teachers Eligibility Test advertisement also is expected to be announced on 10/05/2013 or with in this week or next week. Keep in touch for latest updates and news about the TRB TNTET 2013 announcement. Updated News on 05.05.2013 Source : Dinamalar 05.05.2013 TRB is going to announce Tamilnadu Teachers Eligibility Test TNTET for the year 2013 in the next week. TNTET 2013 exam is expected to be conducted in the month of July 2013 . Last year also the exam was conducted in July month. According to a Tamil Newspaper, TRB sources has informed that, there should be 2.5 months gap beween TRB TNTET 2013 Exam notification and the TRB TNTET 2013 Exam date. It seems that TRB has planned to conduct the Tamilnadu Teachers Eligibility Test Exam 2013 in the month of June 2013 or July 2013. Thus it is expected the announcement may come very soon, may be Last week of April 2013 or First week of May 2013. Since, the Tamilnadu Government has already announced recruitment of nearly 20,000 teachers this year. There is an eagerness among the D.Ted, B.Ed Eligible candidates for the next Tamilnadu TRB Teachers Eligibility. TRB is the conduction authority of TNTET 2013. But there is no proper announcement about the TNTET 2013 Exam. Will TRB Questions Easy this year in 2013 ? Last year ( 2012 ), in the first exam, there were about 6.72 Lakhs aspirants wrote the Teachers Eligibility Test conducted by TRB. Only 0.36 % of candidates could successfully clear the exam. Total 2,448 candidates only came out successfully. ( 1735 DTed candidates and 713 BEd candidates). In the second re-exam 19,246 candidates has successfully cleared TNTET exam. It was about 3 % of the total applicants of about 6.56 lakhs candidates. All the successful candidates were appointed as Teachers by the Tamilnadu Goverment. Thus, to avoid two repetitive exams, TRB may this time make the questions in the Teachers Eligibility Test easier than that of previous year questions. Why TNTET Exam 2013 announcement getting late ? There are so many reasons are said by the people, but the real reason is the B.Ed Examination Date. This year B.Ed Examination date has been set to start on 29th May 2013. More than 70,000 students of 665 Teachers Education Colleges are going to write the examination. TRB may be delaying the Teachers Eligibility Test TNTET 2013 Notification for this reason. Any how the Notification is going to come on the first week of May. Because TNTET exams have been planned to be conducted in the month of June 2013 or July 2013.